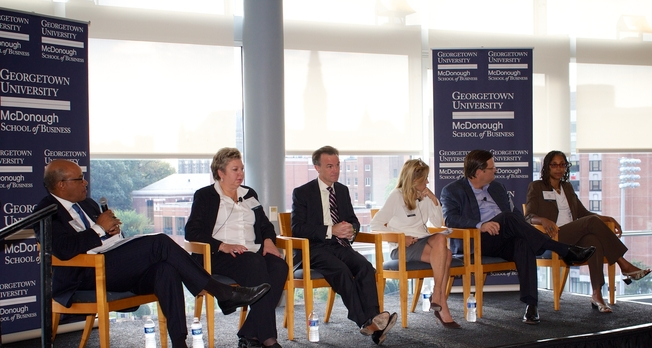 Under the theme “Business people: Closing the Gender Divide” Georgetown’s Annual Conference for Women in Business was a great success. 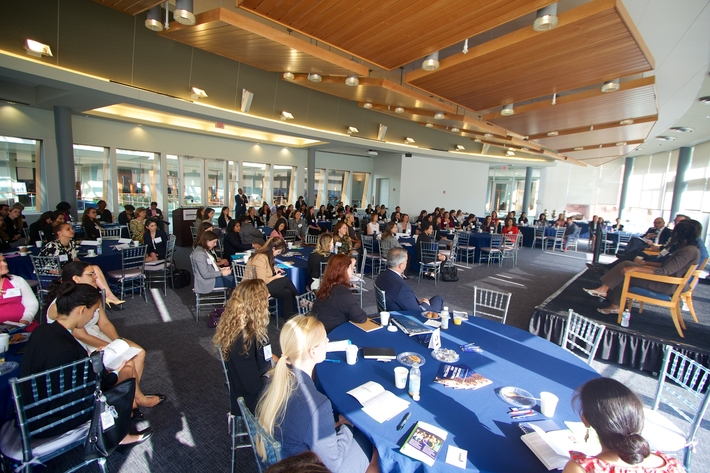 Presented by Georgetown University Women’s Leadership Initiative and McDonough’s Graduate Women in Business (GWiB), this year’s conference attracted over 150 participants including current MBA and undergraduate students, alumni, prospective students, faculty, staff and industry leaders. David A. Thomas, dean of Georgetown’s McDonough School of Business, started the conference moderating the panel discussion “The Conversation: Why We Are Still Talking about Women’s Issues.” A very accomplished panel comprised of female and male leaders from Morgan Stanley, Amherst Holdings and IBM discussed various issues and gave attendees key recommendations for better workplace selection and career advancement. During the second part of the conference attendees had the opportunity to choose from one of three breakout sessions: gender dynamics, women in advertising, and negotiations and the salary gap. These workshops were led by Katherine LaVelle, Managing Director, Talent and Organization, North America Accenture; Carol Melton, Executive Vice President, Global Policy, Time Warner, Inc.; and Christopher Voss, CEO of the Black Swan Group. 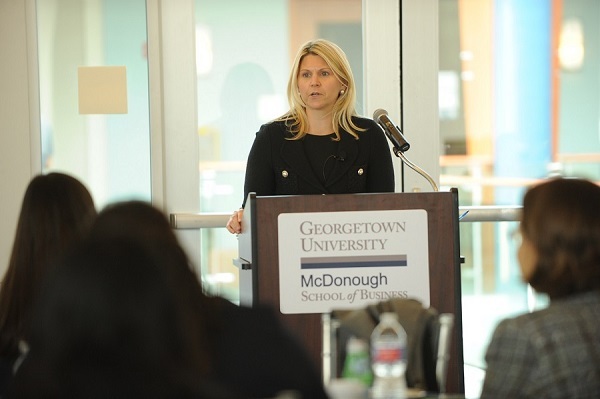 Finally, in her keynote address, executive vice president for marketing and communications at Nielsen, Katie Burke, shared stories from both her corporate and political roles, and gave advice on fostering a successful work/life balance. She also encouraged women to ask questions, share their perspectives, and follow their passions. 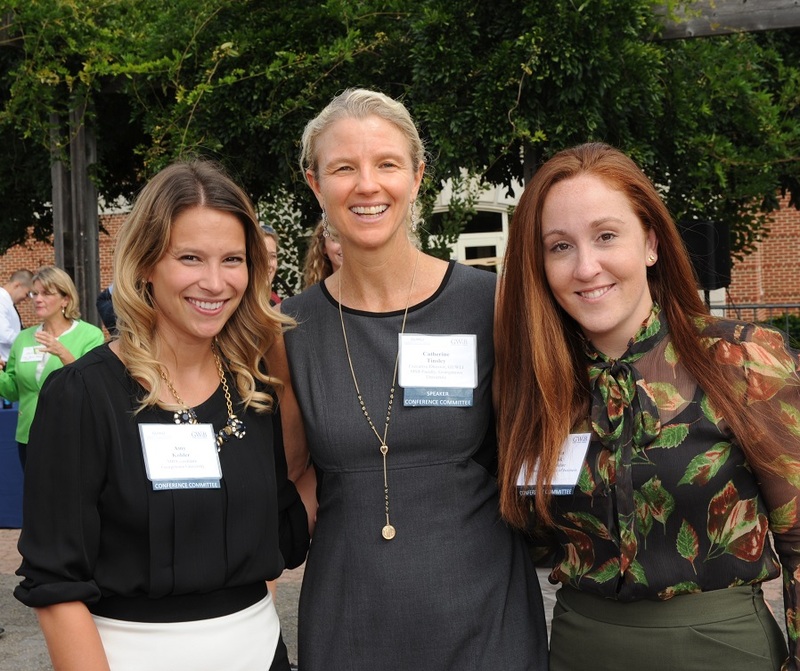 The Conference committee is also very thankful to our sponsors this year, whose support immensely contributed to the success of our event: Accenture, Morgan Stanley, American Express and Liberty Mutual Insurance.